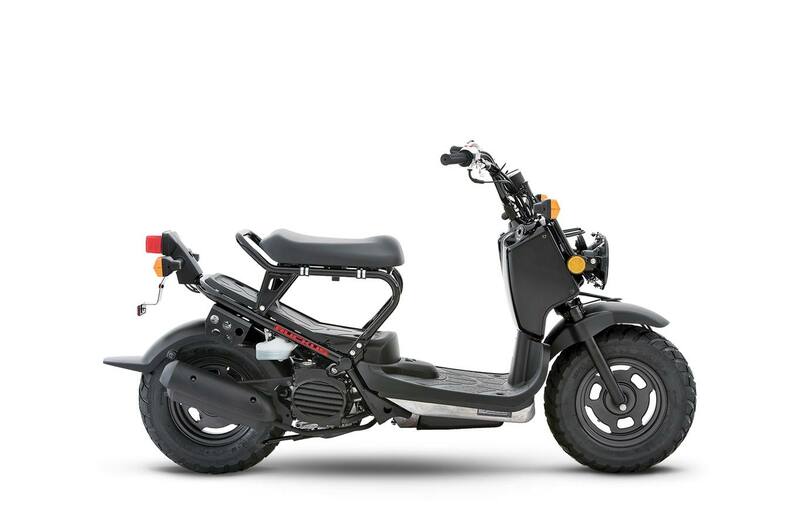 Ample power: Lightweight 49 cc 4-stroke OHC liquid-cooled single-cylinder engine provides ample power for in-town riding. 2017 Model Shown. Easy push-button start: Simple push-button electric starter. 2017 Model Shown. Great on fuel: Fuel-sipping constant-velocity (CV) carburetor with automatic choke. 2017 Model Shown. Intelligent: Electronic Control Unit (ECU) provides control for ignition timing, alternator regulator, ACG starter, electric fuel pump and automatic choke. Ease is key: Maintenance-free ignition system. Improved handling & fuel economy: Starter system utilizes the engine's brushless alternator (ACG) for starting, eliminating the need for a separate starter motor. This simple design reduces maintenance and lowers overall weight for even better handling and fuel economy. Spirited acceleration: Automatic Honda V-Matic belt-drive transmission provides spirited acceleration and requires virtually no maintenance. Low maintenance: Automatic cam-chain tensioner requires virtually no maintenance. Stays cool on hot days: Compact engine-mounted radiator has aluminum fins for optimal cooling in all riding conditions. Comfortable & controlled ride: Twin-downtube-fork front suspension provides 56 mm (2.2 in.) of plush travel for a well-controlled ride. Single-side aluminum swingarm with single-shock rear suspension has 66 mm (2.6 inches) of travel for a compliant, comfortable ride. 2017 Model Shown. Strong & light: Two-piece die-cast aluminum front frame with upper steel rear frame. 2017 Model Shown. Sticks to the road: Oversize tires offer a secure grip on the road. Stopping power: Front and rear drum brakes offer predictable, powerful stopping. 2017 Model Shown. Comfort and confidence: Well-padded seat boasts a low 735 mm (28.9 in.) seat height for added confidence at stops. 2017 Model Shown. Excellent night vision: Dual headlights with two 35-watt bulbs. Low/high beams provide ample nighttime illumination. 2017 Model Shown. Information at your fingertips: Instrumentation includes analog speedometer and odometer, and indicator lights for fuel, coolant temperature and low/high beam. Fuel indicator light comes on with 1.1 litres remaining. 2017 Model Shown. Lock your helmet under seat: Helmet holder locks helmet in place under seat. Put it in park: Parking brake. Backup kickstart lever: Backup kickstart lever. Great warranty: 1 year, unlimited mileage, freely transferable warranty. Audible turn-signal indicator. : Audible turn-signal indicator.